Flock Eco edition is the beginning of a whole new way to look at your web browser. The past 2.5 months have been an interesting transition period; I switched from being the CEO/ Co-founder of VCEL, to being a Flockstar. Switching from being the CEO of VCEL to leading the Affinity editions program at Flock has been a whirlwind transition into the Web 2.0 world vs the Mobile world. I am happy that Flock has such a friendly and professional Team that makes the transition a pleasure. Flock Eco is the first of numerous Flock editions that are dedicated to bringing the "Best of" a specific interest topic like "Eco"/"Green" to the user in a whole new way. This Flock edition engulfs you in all the best news feeds, media streams from services like Youtube, Flickr, Photobucket, Picasa, etc, and Bookmarks on the web for green and eco content. We are going to be releasing more of these content focused editions to help users connect with their favorite web media on topics they love most. These editions are great because they genuinely empower users with a whole new set of possibilities for connecting to their favorite media online. For the Eco edition specifically, Flock's MyWorld creates a dashboard experience of the Best Eco media on the web flowing right in. There is no need for you to go out and browse around for it. This solves the "Out of sight out of mind" attitude problem of the public towards the Green movement. 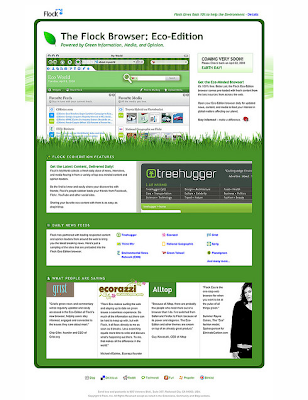 It is important to allow users that care to very easily continuously engage with the Green Awareness message. Of course the standard Flock Social features like the Facebook people sidebar integration, the media bar, photo uploader become powerful Advocacy tools for Eco warriors and enthusiasts. You can share breaking Green stories or youtube videos with your friends as easy as dragging and dropping it onto a friend. For the eco curious they are still the coolest way to connect to your social networks online :) So the point is that Flock Eco demonstrates how you can use Flock's innovative features for creating a focused "channel" of all your favorite media :) However unlike TV it's completely interactive because Flock has all of your social networking friends right there. So we made the "Green" edition (channel) for ya, can you guess which one will be next ?